What are Vicoprofen side-effects and effects? Vicoprofen is the brand name for hydrocodone and ibuprofen combination drug used for pain relief. Short-term effects of misuse include getting high followed by sedation. The risk of death by overdose is high because the opiate hydrocodone slows breathing. Long-term effects include tolerance, dependence, addiction, withdrawal sickness, and danger of switching to more dangerous drugs like heroin. Vicoprofen is the brand name for a medication having hydrocodone and ibuprofen. Hydrocodone is an opiate, the class of sedative pain relieving drugs. Ibuprofen is a non-steroidal anti-inflammatory medication. 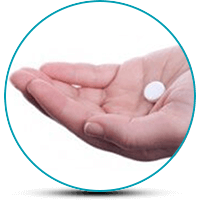 Each Vicoprofen tablet contains 7.5mg of hydrocodone and 200mg of ibuprofen and is prescribed for short-term pain or as a cough suppressant. It is not recommended for long-term pain management. As an opiate, Vicoprofen suppresses the central nervous system (CNS). When someone takes too much, the CNS suppresses breathing to a stop causing some people to die of an overdose. Excessive use of ibuprofen can cause stomach and intestinal problems. The immediate short-term effects include death by overdose and the physical dependence that can develop even after short-term use. If someone is abusing Vicoprofen, after a few times, the body will get used to the substance. The amount used must increase each time to get high. This process is called tolerance. Also, the body also develops a dependency on the drug and without it, adverse effects set in. Withdrawal symptoms can start soon after repeated use. Also, when they cannot get high using Vicoprofen, or when getting the pills becomes too much of a hassle, that person is likely to switch to stronger, more accessible opiates. Other short-term effects may include changes in the sleep cycle and mood patterns, secrecy surrounding activities, forgetfulness, chronic constipation, and mental fogginess. The longer someone misuses Vicoprofen, the more pronounced the physical symptoms become. Sometimes these effects are visible even when someone is not using the drug. If someone is abusing opiates, their body will crave the substance and get sick without it. Sickness with constipation, abdominal cramps, sweating, muscle and joint pain comes on quickly along with feeling anxious, restless, and not being able to sleep. When withdrawal symptoms get bad, signs become more visible. Researchers are still trying to figure out the effects of long-term opiate use regarding brain damage. Some find that it affects decision-making abilities, behavioral regulation, emotional regulation, and responses to stressful situations. The slippery slope continues very rapidly, and the person using opiates needs more of the same or will often switch to a more potent drug. For example, part of the federal government’s concern about prescription opioid misuse is that users tend to switch to stronger, cheaper opiates like heroin once the prescription opiates no longer meet the body’s needs. Escalation of the method of administration is also a concern. For example, someone may start using prescription Vicoprofen pills. As the need for more increases, they may crush the pills and snort them to get it into their system faster. Achieving tolerance to this method, they may escalate to something stronger like heroin which is injectable. Injecting a drug directly into the bloodstream is the quickest method of administration and indicative of other health dangers associated with self-injection. Substances the mother takes passes on to the baby. Women who misuse Vicoprofen while pregnant take the risk that their baby will be born experiencing withdrawal symptoms. These symptoms are miserable for an adult to experience but become life-threatening for a newborn. Also, research shows babies born addicted to opioids are more likely to have developmental delays and disabilities. In a study of high school seniors, researchers found 12.4% of students used opiates for nonmedical purposes at least once in their lifetime. Prolonged misuse of prescription drugs such as Vicoprofen beginning in adolescence may cause lasting brain damage and cognitive problems. Vicoprofen is the brand name for hydrocodone and ibuprofen combination drug used for pain relief. Short-term effects of misuse include getting high followed by sedation. The risk of death by overdose is high because the opiate hydrocodone slows breathing. Long-term effects include tolerance, dependence, addiction, withdrawal sickness, and danger of switching to more dangerous opiates like heroin.